Background: Failed intubation is imperative source of anesthetic interrelated patient's mortality. 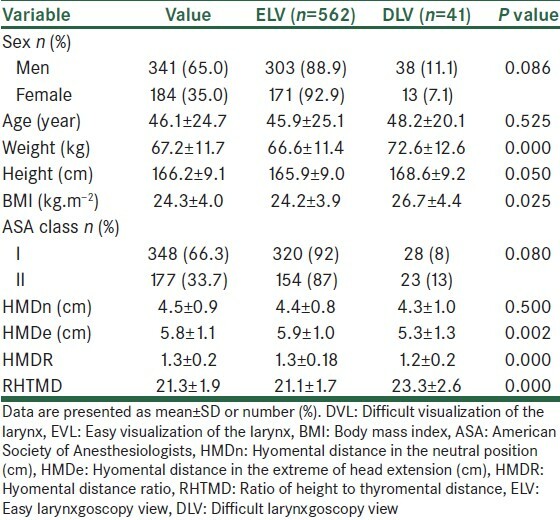 The aim of this present study was to compare the ability to predict difficult visualization of the larynx from the following pre-operative airway predictive indices, in isolation and combination: Modified Mallampati test (MMT), the ratio of height to thyromental distance (RHTMD), hyomental distance ratios (HMDR), and the upper-lip-bite test (ULBT). Materials and Methods: We collected data on 525 consecutive patients scheduled for elective surgery under general anesthesia requiring endotracheal intubation and then evaluated all four factors before surgery. A skilled anesthesiologist, not imparted of the noted pre-operative airway assessment, did the laryngoscopy and rating (as per Cormack and Lehane's classification). Sensitivity, specificity, and positive predictive value for every airway predictor in isolation and in combination were established. Results: The most sensitive of the single tests was ULBT with a sensitivity of 90.2%. The hyomental distance extreme of head extension was the least sensitive of the single tests with a sensitivity of 56.9. The HMDR had sensitivity 86.3%. The ULBT had the highest negative predictive value: And the area under a receiver-operating characteristic curve (AUC of ROC curve) among single predictors. The AUC of ROC curve for ULBT, HMDR and RHTMD was significantly more than for MMT (P < 0.05) . No significant difference was noted in the AUC of ROC curve for ULBT, HMDR, and RHTMD (P > 0.05). Conclusion: The HMDR is comparable with RHTMD and ULBT for prediction of difficult laryngoscopy in the general population, but was significantly more than for MMT. The importance of pre-operative prediction of a difficult airway is obvious: 85% of all mistakes regarding airway management result in permanent cerebral damage,  and up to 30% of all anesthetic deaths can be attributed to the management of difficult airways. , For patients in whom a general anesthetic is desirable or needed, a variety of factors have been recognized that when present possibly will yield intubation difficult. These concomitant factors may be separated into patient characteristics, factors related with the general populations, and factors linked with anesthesia. Difficult laryngoscopy (characterized by poor glottic visualization) is synonymous with difficult intubation in most patients. Difficult intubation is described in 1.5-13% of patients. Recognition of those patients in whom intubation might be difficult is the ideal that we attempt to attain. Unhappily, the techniques of evaluation we presently employ clinically do not precisely predict which patients will be difficult to intubate. Several investigation explain prediction schemes by applying a single risk factor or a multifactorial index. , One test for difficult laryngoscopy is the upper-lip-bite test (ULBT), assesses the possibility of a patient to cover the mucosa of the upper lip with the lower incisors. Grade 1 (the lower incisors can completely cover the upper lip's mucosa) and Grade 2 (the lower incisors can touch the upper lip but cannot completely cover the mucosa) are considered to predict easy laryngoscopy and are compared with Grade 3 of the ULBT (the lower incisors fail to bite the upper lip), which was noticed to be associated with difficult laryngoscopy. Another test for difficult laryngoscopy is the thyromental distance (TMD), which is different according with patient size. Nevertheless, numerous studies question whether the TMD is either sensitive or specific enough to be used as the only predictor of difficult laryngoscopy. Even though, Schmitt et al. showed that the ratio of height to TMD (ratio of height to thyromental distance [RHTMD] height [cm]/TMD [cm]) had a better predictive value than the TMD, no published study has quantified its sensitivity, specificity and positive predictive value (PPV) versus the ULBT and the Mallampati classification,  revised by Samsoon and Young for evaluating patient's airway for difficult laryngoscopy. Recently, Takenaka et al. defined the ratio of the HMD in the neutral position (HMDn) and at the extreme of head extension (HMDe) as the hyomental distance ratio (HMDR) and demonstrated that it was a good predictor of a reduced occipitoatlantoaxial complex extension capacity in patients with rheumatoid arthritis [Figure 1]. The ability to predict a difficult tracheal intubation permits anesthesiologists to take precautions to decrease the risk. 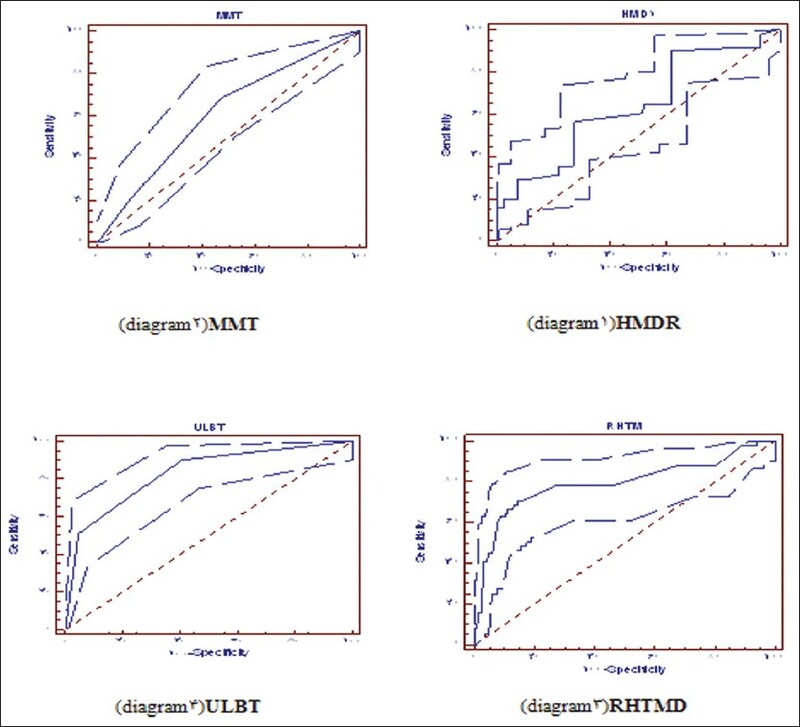 The predictive value of Mallampati classification, the HMDR, RHTMD and the ULBT methods of airway assessment for difficult laryngoscopy were investigated before in different separate studies. It was not clear, which method can be predicted difficult laryngoscopy better. No previous study on one sample population was performed to answer to this question. Hence, we performed a prospective, blind study of the predictive value of the Mallampati classification revised by Samsoon and Young versus the HMDR, RHTMD, and the ULBT methods of airway assessment for difficult laryngoscopy in patients required tracheal intubation for general anesthesia. This prospective observational study was approved by the Ethics Committee of our university, and all patients gave written, informed consent. We subsequently studied 525 successive ASA physical status I-III adult patients programmed to be given general anesthesia necessitate endotracheal intubation for elective surgery. Patients with a history of previous surgery, burns or trauma to the airways or to the cranial, cervical and facial regions, patients with tumors or a mass in the above-mentioned regions, patients with restricted motility of the neck and mandible (e.g., rheumatoid arthritis or cervical disk disorders), inability to sit, edentulous or need awake intubation were excluded from the study. Patients younger than 18 year of age, with apparent malformations of the airway, incapability to sit, recent operation of the head and neck, edentulous, or have need of awake intubation were kept out from the study to prevent the introduction of a variable that might separately influence predictability of difficult laryngoscopy. If it was necessary to attempt laryngoscopy for more than 1 time or it was needed to use a different technique for successful intubation or time to accomplish the intubation was more than 15 s, the patient was excluded from the study. RHTMD: TMD was measured from the bony point of the mentum while the head was fully extended and the mouth closed. Then the ratio of height to TMD was calculated. HMDR: The HMDR was calculated as the ratio of the HMDe to that in the neutral position. Patients were instructed to look straight ahead, keep the head in the neutral position, close the mouth and not swallow. A hard-plastic bond ruler was pressed on the skin surface just above the hyoid bone, and the distance from the tip to the anterior-most part of the mentum was measured and defined as the HMDn [Figure 1]. Patients were then instructed to extend the head maximally, taking care that the shoulders were not lifted while extending the head. The HMD was measured again in this position, and this variable was defined as the HMD at the extreme of head extension. On arrival in the operating room, routine monitoring, including non-invasive arterial blood pressure, an electrocardiogram and oxygen saturation, were introduced. Induction of anesthesia was with 4 mg/kg of sodium thiopental intravenous (i.v.). Atracurium 0.6 mg/kg i.v. was administered to facilitate endotracheal intubation. The patient's lungs were ventilated by mask with 100% oxygen. Another single anesthesiologist with 10 year experience in anesthesia, who was not informed of the pre-operative classes, performed laryngoscopy and evaluated difficulty of laryngoscopy at intubation. The head of the patient was placed in the "sniffing" position and laryngoscopy was done with using a Macintosh #4 blade to visualize the larynx and the view was classified using the Cormack and Lehane (CL) classification,  without external laryngeal manipulation: (1 = vocal cords visible; 2 = only posterior commissure or arytenoids visible; 3 = only epiglottis visible; 4 = none of the foregoing visible). If it was necessary to apply external laryngeal pressure, the case was excluded from the study. Difficult visualization of the larynx (DVL) was described as CL 3 or 4 views on direct laryngoscopy. Easy visualization of the larynx (EVL) was defined as CL 1 or 2 view on direct laryngoscopy. Confirmation of successful intubation was by bilateral auscultation over the lung fields and capnography. A prospective power analysis disclosed that presuming a frequency of difficult laryngoscopy of 5%, 400 patients offer a power of more than 80% to find out an improvement of discriminating power (measured by the area under a receiver-operating characteristic curve [AUC of the appropriate ROC curve]) of an absolute value of 15% (e.g. from 50% to 0.65%) with a type I error of 5% and using a two-sided alternative hypothesis. By means of these clinical data (Mallampati score, the RHTMD, ULBT, HMDR score, and the CL classification) noted for each patient, several measures were computed that have been commonly used to explain the predictive properties of a scoring system. Using these clinical data recorded for each patient and the sensitivity, specificity, positive likelihood ratio (+LR) and negative likelihood ratio (−LR), PPV, and negative predictive value (NPV) of each test were calculated. Secondly, combinations of predictors were formulated. Likewise, the sensitivity, specificity, +LR, −LR, PPV, and NPV were obtained and compared among the combinations. The AUC of ROC curve,  was used as the main end-point of the study to determine whether or not the score was clinically valuable. A ROC plot was achieved by calculating the sensitivity (true positive fraction) and specificity (true negative fraction) of every observed data value (cut-off value), and plotting sensitivity against 1-specificity (false positive fraction). A value of 0.5 under the ROC curve indicates that the variable performs no better than chance and a value of 1.0 implies perfect discrimination. A larger area under the ROC curve denotes more reliability,  and good discrimination of the scoring system. In addition, the ROC curves were used to recognize the optimal predictive cut-off points for each test. The most favorable predictive cut-off point is the point on the ROC curve that is nearest (unweighted distance) to the ideal point (sensitivity = 100%; false positive = 0%). Patient data were presented as mean ± SD or numbers (%). BMI was determined from weight (kg)/height 2 (m). Patient data and value of the airway predictors were compared using t-tests for continuous variables and U-test for MMT or ULBT. Differences between the AUC values of three predictive tests were analyzed using MedCalc statistical software 9.3.6.0, and a P value of 0.05 was defined as statistically significant. All other calculations were performed using the SPSS version 16.0. A total of 538 patients were enrolled in the study. 13 patients were excluded (three patients due to previous surgery on the airway, two patients due to restricted motility of neck, three patients due to mass in the neck, four patients due to being edentulous, and one patients due to need to awake intubation). Finally, 525 patients were included in our study. No patient was excluded from the study due to any problem. We had two cases with Grade 4 CL. the tracheal intubation in these two patients was performed by using the GlideScope video laryngoscopes. Demographic characteristics, BMI and the mean for HMDe, HMDn in the neutral position, the HMDR and RHTMD are shown in [Table 1]. The incidence of DVL was 51 (9.7%). No case of failed intubation was noted. Our data showed that there were significant differences in weight, BMI, HMDe, the HMDR and RHTMD between the DVL and EVL patients [Table 1]. The distribution of MMT, ULBT, the CL grades are presented in [Table 2]. The predictive values of MMT, ULBT, HMDn, HMDe, HMDR and RHTMD are presented in [Table 3]. A ULBT Grade 2 and MMT Grade 3 were considered as the cut-off points for predicting difficulty by using the discrimination analysis. The most sensitive of the single tests was ULBT with a sensitivity of 90.2%. The HMDe was the least sensitive of the single tests with a sensitivity of 56.9. The HMDR had sensitivity 86.3%. The ULBT had the highest NPV (negative predictive value) and the AUC of ROC curve among single predictors. The AUC of ROC curve for ULBT, HMDR and RHTMD was significantly more than for MMT (P < 0.05) [Table 3]. No significant difference was noted in the AUC of ROC curve for ULBT, HMDR, and RHTMD (P > 0.05). The combination of the four tests decreased the AUC of ROC curve compared with the HMDR, RHTMD, MMT, and the ULBT as single predictors. The combination with the best results was the Mallampati test-RHTMD with specificity, the PPV, the AUC of ROC curve of 100.0%, 100.0%, and 0.843 respectively. The various other combinations resulted in decreased sensitivity and the AUC of ROC curve [Figure 2]. By using discrimination analysis, the optimal cut-off point for the HMDR and RHTMD for predicting difficult laryngoscopy was 1.10 (sensitivity, 86.3%; specificity, 69.7%) and 22.25 (sensitivity, 70.6%; specificity, 85.2%) respectively. The multivariate analysis odds ratios (95% CI) of the HMDR, RHTMD, Mallampati class and ULBT were 1.653 (0.616-4.433), 0.104 (0.059-0.183), 0.610 (0.321-1.161) and 0.097 (0.061-0.154), respectively. The multivariate analysis relative risk (95% CI) of the HMDR, RHTMD, Mallampati class and ULBT were 0.956 (0.891-1.026), 1.467 (1.276-1.687), 1.067 (0.963-1.183), and 2.067 (1.519-2.814), respectively. A major factor that has been considered to be related to the morbidity and mortality following anesthesia is unexpected difficult intubation. For this reason, it is necessary to investigate for a simple and accurate predictive test. The previous studies reported that the incidence of difficult intubation was 1.3-13%, which was depending to the criteria employed for its definition. ,,,,,, According to the obtained results of this study, the sensitivity of HMDR test is 56.86% and the specify of that is 72.3% and PPV (positive predictive value) is not in acceptable situation and is about 18.1% although the NPV (negative predictive value) is inacceptable situation about 94% according to the significant of determining. The difficult intubation in patients in operations room, this test is not reliable. In the same study that carried out by Huh et al.,  HDMR is a reliable test for evaluating the DLV and has the reliable prediction value about 2% in other test, which checked is MMT test. The sensitive of that is 68.63% and specify is 52.85% and the epidemiology view is not suitable examination for screening. And positive and NPV is 13.6% and 94%. The positive results are valuable. Another test that checked in this study is RHTMD test, which has sensitive and specificity about 70.59%, 85.41% and in proportion to other two tests has high valuation in predictive difficult visual of larynges. However, this test similar to other tests has suitable NPV about 96.4%. Finally, the ULBT test is the last test which has sensitivity and specify about 90.20% and 59.41%.And if want to use one test for screening the ULBT test is better because this test has the most sensitivity. Otherwise ULBT test has positive and NPV about 19.3% and 98.3% so that the negative results of ULBT test is valuable for determining the patient's situation. Khan et al.,  understood that ULBT is a reliable test for predicting difficult intubation. We designed our study in elective surgical patients while emergency cases were not included in the study. Furthermore, our conclusion is not applicable to all subgroups of the general population such as elderly, obese or patient candidate for cesarean delivery. 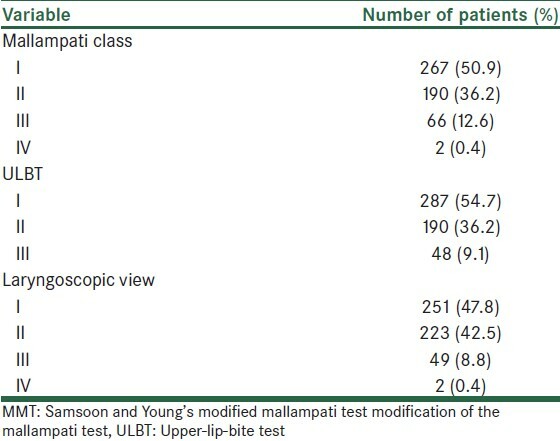 In conclusion: By the way evaluating and comparing the above tests shows that each one has advantages and disadvantages according to result of this study validity and reliability of ULBT, RHTMD, HMD, and MMT are not possible for prediction of difficult laryngoscope and yet the Cormack lyhan test is the most suitable test in hard difficult intubation in patients under intubation. The authors wish to sincerely thank the support of all the colleagues in Kashani Hospital Medical Center affiliated to Isfahan University of Medical Sciences in Isfahan, Iran. Furthermore, our special thanks go to the patients, who wholeheartedly and actively assisted us to carry out this research. No conflict of interest existed. This study was approved by the Ethics Committee of our university, (Isfahan University of Medical Sciences) and all patients gave written, informed consent. 1. Caplan RA, Posner KL, Ward RJ, Cheney FW. Adverse respiratory events in anesthesia: A closed claims analysis. Anesthesiology 1990;72:828-33. 2. Benumof JL, Scheller MS. The importance of transtracheal jet ventilation in the management of the difficult airway. Anesthesiology 1989;71:769-78. 3. Bellhouse CP, Doré C. Criteria for estimating likelihood of difficulty of endotracheal intubation with the Macintosh laryngoscope. Anaesth Intensive Care 1988;16:329-37. 4. Mallampati SR, Gatt SP, Gugino LD, Desai SP, Waraksa B, Freiberger D, et al. A clinical sign to predict difficult tracheal intubation: A prospective study. Can Anaesth Soc J 1985;32:429-34. 5. Benumof JL. Difficult laryngoscopy: Obtaining the best view. Can J Anaesth 1994;41:361-5. 6. Arné J, Descoins P, Fusciardi J, Ingrand P, Ferrier B, Boudigues D, et al. Preoperative assessment for difficult intubation in general and ENT surgery: Predictive value of a clinical multivariate risk index. Br J Anaesth 1998;80:140-6. 7. Rocke DA, Murray WB, Rout CC, Gouws E. Relative risk analysis of factors associated with difficult intubation in obstetric anesthesia. Anesthesiology 1992;77:67-73. 8. L'Hermite J, Nouvellon E, Cuvillon P, Fabbro-Peray P, Langeron O, Ripart J. The Simplified Predictive Intubation Difficulty Score: A new weighted score for difficult airway assessment. Eur J Anaesthesiol 2009;26:1003-9. 9. Oates JD, Macleod AD, Oates PD, Pearsall FJ, Howie JC, Murray GD. Comparison of two methods for predicting difficult intubation. Br J Anaesth 1991;66:305-9. 10. Khan ZH, Kashfi A, Ebrahimkhani E. A comparison of the upper lip bite test (a simple new technique) with modified Mallampati classification in predicting difficulty in endotracheal intubation: A prospective blinded study. Anesth Analg 2003;96:595-9. 11. Braz LG, Módolo NS, do Nascimento P Jr, Bruschi BA, Castiglia YM, Ganem EM, et al. Perioperative cardiac arrest: A study of 53,718 anaesthetics over 9 yr from a Brazilian teaching hospital. Br J Anaesth 2006;96:569-75. 12. Butler PJ, Dhara SS. Prediction of difficult laryngoscopy: An assessment of the thyromental distance and Mallampati predictive tests. Anaesth Intensive Care 1992;20:139-42. 13. Schmitt HJ, Kirmse M, Radespiel-Troger M. Ratio of patient's height to thyromental distance improves prediction of difficult laryngoscopy. Anaesth Intensive Care 2002;30:763-5. 14. Takenaka I, Iwagaki T, Aoyama K, Ishimura H, Kadoya T. Preoperative evaluation of extension capacity of the occipitoatlantoaxial complex in patients with rheumatoid arthritis: Comparison between the Bellhouse test and a new method, hyomental distance ratio. Anesthesiology 2006;104:680-5. 15. American Society of Anesthesiologists Task Force on Management of the Difficult Airway. Practice guidelines for management of the difficult airway: An updated report by the American Society of Anesthesiologists Task Force on Management of the Difficult Airway. Anesthesiology 2003;98:1269-77. 16. Samsoon GL, Young JR. Difficult tracheal intubation: A retrospective study. Anaesthesia 1987;42:487-90. 17. Lewis M, Keramati S, Benumof JL, Berry CC. What is the best way to determine oropharyngeal classification and mandibular space length to predict difficult laryngoscopy? Anesthesiology 1994;81:69-75. 18. Cormack RS, Lehane J. Difficult tracheal intubation in obstetrics. Anaesthesia 1984;39:1105-11. 19. Hanley JA, McNeil BJ. The meaning and use of the area under a receiver operating characteristic (ROC) curve. Radiology 1982;143:29-36. 20. Schniederjans MJ. Mathematical partitioning of the receiver operating curve: A diagnostic tool for medical decision making. Socioecon Plann Sci 1985;19:125-35. 21. Tiret L, Desmonts JM, Hatton F, Vourch G. Complications associated with anaesthesia-a prospective survey in France. Can Anaesth Soc 1986;33:336-44. 22. Zuercher M, Ummenhofer W. Cardiac arrest during anesthesia. Curr Opin Crit Care 2008;14:269-74. 23. Arndt M, Benad G. The risks of anesthesia in obstetric interventions. Anaesthesiol Reanim 1994;19:88-94. 24. Langeron O, Masso E, Huraux C, Guggiari M, Bianchi A, Coriat P, et al. Prediction of difficult mask ventilation. Anesthesiology 2000;92:1229-36. 25. Rose DK, Cohen MM. The airway: Problems and predictions in 18,500 patients. Can J Anaesth 1994;41:372-83. 26. Huh J, Shin HY, Kim SH, Yoon TK, Kim DK. Diagnostic predictor of difficult laryngoscopy: The hyomental distance ratio. Anesth Analg 2009;108:544-8. 6 Predicting difficult airways: 3-3-2 rule or 3-3 rule?